The chunkier the better is the theme of this gorgeous, squishy cowl. Big needles and super-bulky yarn make for a super fast and fun project. The cowl is cast on lengthwise and worked in the round for a seamless project. 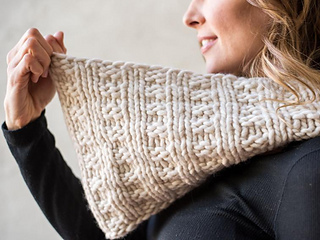 The waffle stitch is a simple four round repeat that is easily memorized.You’ll love wearing and gifting this quick-knit project!